by Kalid Persica (Kalid ben Jazichi). Written originally in Hebrew, and translated thence into Arabick, and out of Arabick into Latin. Now it being faithfully rendered into English by William Salmon, Professor of Physick. 1691. 67 pages. Extract of Chapter 22 - 36. Third Edition, by Jean Espagnet. by Sir Kenelm Digby Kt. Chancellor to Her Majesty The Queen Mother. Translated by George Hartman, London, 1608. A Choice Collection of rare Chemical Secrets and Experiments in Philosohy. Author of "Metaphysical Astrology”, “The Sun Book” etc. New York. MCMIV. Imprinted by Thomas Orwin. London 1591. 85 pages. In twelve gates. Originally part of "Diverse Alchemical Tracts" collected title. (DIVERSETRACTS / SAL_LUMEN .doc, .pdf). (DIVERSETRACTS / FOUNTAIN_CHEM: .doc, .pdf). Translated by Dr. S. Billingham. (DIVERSETRACTS / TEIPSUM: .doc, .pdf). A collection of Alchemical symbols from several sources (including Medicinisch-Chymisch und Alchemistisches Oraculum..), gathered by Hans Ninztel and others starting with a table of Basil Valentine's, including "Glossary of Latin Terms". To even begin to read the manuscripts from Bacstrom and some others in the R.A.M.S. collection, you will often refer to this symbol table. A Description of Nature & Natural Things. How and from what they are generated and how they are destroyed again, and what that subject is which generates, destroys and regenerated things, & etc. Franckfurt and Leipzig. 1723. Translated from the German by Sigismond Bactsrom, M.D. 1797. "Annulus Plantonis (Platonic Ring)" or "A Physico-chemico Explanation of Nature including its Origin, Preservation & Destruction from Anton Joseph Kirchweger. Literally printed through the Rosicrucian edition of 1781. Berlin 1921." 498 pages. In two parts. Master to Paracelsus. 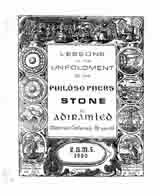 "In which is succintly and methodically handled, the Stone of the Philosophers, his excellent effect & admirable Virtues, and the better to attain to the Original & true means of Perfection". by John de Monte Snyder. "A Wonderful Transmutation of the Planets and Metallic Formes into their first Essence (with an annexed process), being a discovery of the three keys pertinent to the obtaining of the three principes. Likewise in what manner the most generall universal is to be obtained is in many places of this treatise....". 1663, (second ed. 1700). 89 pages. Preface, 31 Chapters, A Momento. by Abtala Jurain, filii Jacob Juran from the Ethiopian translated into Latin - and from Latin translated into the German by Dr. Johann Elias Muller, and from the German in 1983 by Leone Muller. 1732. "The Whole Work of the Composition of the Philosophical Stone and Grand Elixir, and of the First Solution of the Grosse Bodies." "His answer to W. Dickenson concerning: Quintessence of the Philosophers." British Museum, Sloane 3762. Paris, 10 October, 1684. Liber Nichola Hinckley. 1692. ; translated from the latin by Edmund Brice. Translated out of the Latin into English and claused by: William Salmon, professor of physick. 79 pages. Extract of Chapter 37 - 60. 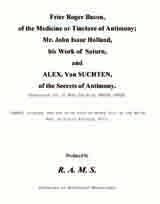 The Second Treatise to the Honourable John Baptista van Seebach by Alexander von Suchten. or "The Marrow of Alchemy". Written in Latin by George Ripley, Canon of Bridlington, which he sent out of Italy anno 1476. To the Arch-Bishop of York. Translated into English by William Salmon, Professor of Physick. 79 pages. 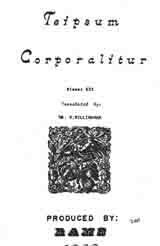 Extract of Chapter 61 - 73.
by David Beuther. Guardian of the Mint at Dresden and Expert in the Practice of Alchemy for the Elector Augustus of Saxony (1575 – 1582) Universal and Detailed Account, in which: The transmutation of base metals into gold and silver will be explained clearly and precisely, along with an Appendix containing unique alchemical copper-plate prints which reveal the Art from beginning to end and a Preface which documents Beuther’s training and publications, along with those of Dr Johannes Christopher Spregels of the Academy of Hygienic Treatment and Medicine of Hamberg Printed by Samuel Heyl of St Johns Church, Hamburg, 1718. Rabbi Abraham Eleazar (1092 - 1167). A Very Ancient Alchemical Work Which was formerly written by the Author, partly in Latin and Arabian, partly in Chaldee and the Syriac Language and Written Afterwards by one who remains Anonymous. 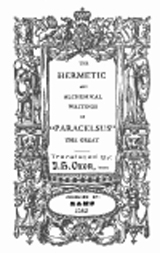 Written for the use and employment of the Lover of the Noble Hermetic Philosophy Jacob Bern. Fran. Exkhart, 1774. Translated from the French by Lynn Bacarella. by Henri de LinTaut, circa 1700. Translator: Wilson Wheatcroft, India, 1982. It was published in the 17th Century from a badly damaged, hand written manuscript by Lintaut. It was later republished in 1978 in old (or Medaeval) French. The original printing is listed in the Arsenal Library under No. 3020.
by Lord Blaise of Vigenere. Discovering Many Secret Mysteries, aswell Philosophicall, as Theologicall London. 1649. The Golden Work of Hermes Trismegistus. Translated out of Hebrew into Arabick, then into Greek, afterwards into Latin; and now done out of Latin into English, Claused and largely Commented upon by William Salmon, Professor of Physick. 1692. A Recapitulation by Orthelius of Sendivigius. 1654. Translated from the Latin by Patricia Tahil. "Where in not only is shown the true PHILOSOPHICAL SUBJECT but also how such is to be, sought, and then how such should be prepared", Franckfurt and Leipzig, 1739. 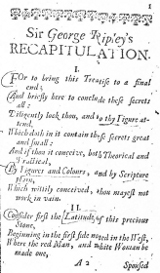 Collected and Digested by William Salmon 1644-1713, Professor of Physick. Declaring the most concealed secret of ALCHEME. Written first in Latin by and Unknown Author, but explained in Italian by John Baptista Lambye, Venetian. Lately translated into English by R. N. E. Gentleman. Translated from the Von Ehrenthal Manuscript (1743. Wellcome Institute MS. 2283), 'Montesnyder. De medicina universali'. Apparently an epitome of a work first published in 1662, perhaps made by von Ehrenthal himself. by Johan Isaaci Hollandus. Translated from German. (HOLLANDUS / MINERAL: .doc, .pdf). Translated from German by Leone Muller, 1978. (HOLLANDUS / URINESTONE: .doc, .pdf). by Johan Isaaci Hollandus. Translated from German. R.A.M.S. 1980. (HOLLANDUS / PHILOSOPHERSHAND: .doc, .pdf). Preface by Filius Sendivogii, England, 1659. 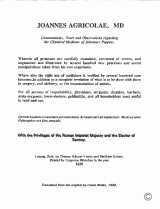 (HOLLANDUS / VEGETABLE: .doc, .pdf). by Basilius Valentinus (Basil Valentine). 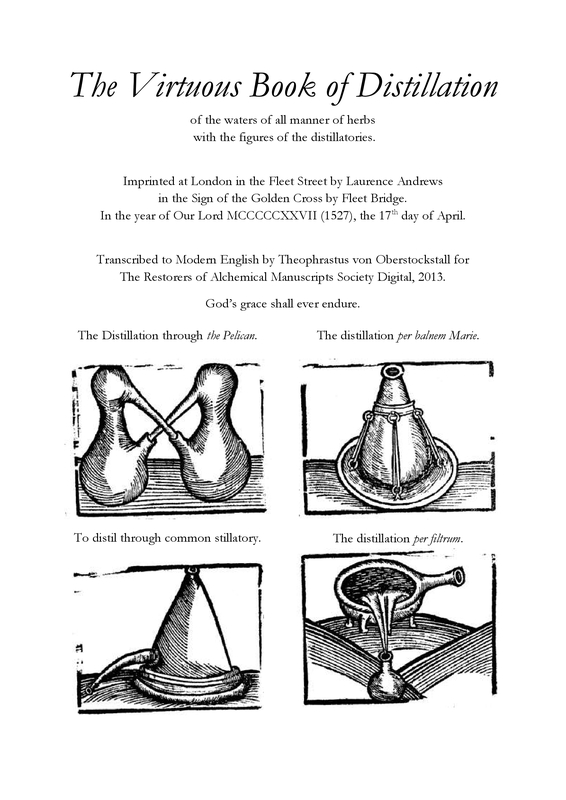 A key work studied by students of the art of Alchemy. WITH THE COMMENTARY OF THEODORE KIRCKRINGIUS, A Doctor of Medicine. First published Leipsig, 1604. Further editions in German were issued in 1611, 1624, 1676 and 1757. A Latin edition was published in 1646. An English version was published in 1660, and there were also 1667, 1678 and 1685 editions. "Leading the Way to The Wonder of The World to Long Life, Health, Youth, Blessedness, Wisdom and Virtue." London. 1662. BOOK I: The Holy Guide: Leading the way to Unite Art and Nature. BOOK II: The Holy Guide: Leading the Way to The Wonder of The World. The Sixth Book: The Rosie Cross Uncovered. or a General System of Chymical, Metaphysical, & Mathmatic Knowledge in which The Origin, natural properties of The Three Principles of Nature are Fully described. The Production & Maturation of Metals & Minerals. A Complete Treatise upon The Wisdom of God & The Excellency of Nature. With a General Key Enriched with a Great Variety of Metaphysical, Mathematical & Theosophic Figures. Forming a Complete Treatise upon The Abstract & Useful Arts & Sciences. Translated from the Original German of Baron George Von Welling, and Carefully corrected and Revised by: Francis Barrett F.R.C. (with Additional Notes & Observations) London June 1801.
by Count Stefan C. Walewski. by Edward Norvell. B.M. Sloane #2567.
by Pico della Mirandola, fr. 1463 – 1494. Published by Dr. G. A. Fuchs in Collected Volumes 1885-1916 of the Provincial Library (Vol. 8, History of Literature, p. 417), and in the Annual Report of the Communal College of Komotau (Bohemia) from a Manuscript from the Ossegg Foundation. Being an Experimental Treatise, Discovering The Secret and Most Hidden Mystery of the Philosophers Elixer. Divided into Two Books: The First Containging Four Books Chiefly Illustrating the Theory, The Other Containing Three Books, Elucidating the Pratique of the Art. London. 1654.
by Quercetanus (Joseph Du Chesne). A Collection of the Most Precious and Rare Secrets, Taken from the Manuscripts of the late Monsieur Joseph Du Chesne, Sieur de la Violette, Officer and Physician in Ordinary to the King. Paris, 1641.
which Baron Von RUESENSTEIN Learned on His two Journeys with six Adepts: Gualdo, Schulz, Fauermann, Koller, Fornegg and Monte Schider. Frankfurt and Leipzig, (Peter Conrad Monath) 1754. And now translated from the German: 1988. Containing: A Hermetic Compendium, A Chymical Antidote, & A Chymical Therapeutics. 1662. Translated from French by: Leone Muller. "A New Light on Chemistry". 1654. Rosicrucian, Masonic & Alchemical Script. Translated from French & German by: Leone Muller. Or, "A Manifest Declaration of the Sanguine and Solar Congealed Liquor of Nature." Londin 1696. British Musuem MS Sloane no. 2037. An old german alchemical manuscript containing various 'recipes'. 1531. A Discourse of Solinus Saltztal's "Fountain of Philosophical Salt"
A Cyhmico-Kabalistic Treatise. Collected from the 'Kabala Denudata' of Knorr Von Rosentoth.Translated by a Lover of Philalethes, 1714. 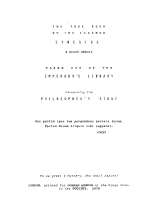 Preface, notes and explanations by "Sapere Aude". [pseud. of W. Wynn Westcott]. Collectanea Hermetica. 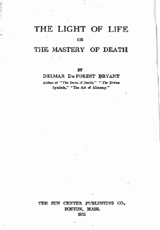 Edited by W. Wynn Westcott, 1897, S.M. of the Soc. Rosic. in Anglia, W.M. of the Quatuor Coronati Lodge. "The Epistle of John Pontanus". Mentioned in the Preface of Artephius his secret Book (1150). Wherein he bears witness of the Book translated out of the Latin copy Extant in the third of Theatrum Chemicum at the 75th page. Translated out of Latin By William Salmon, Professor of Physick. Faithfully re-typed by a meer student of the Hermetic Art. Described by A Member of the Inner Constitution of the Genuiune and True Freemasonry. Published with Annotations, A dedication and Introduction in which the history of this illustrious Order, from the beginning of its establishment, is clearly reported, and the errors of some degenerated French Freemasonic Lodges are exposed, by Metmia Vere. Berlin and Leipzig. By Christian Ulrich Ringmacher. 1779. Translation from the German by Leone Muller. Published by Eugenius Philalethes, London, 1657. S. Bacstrom M.D. "The Chemists Key to shut and Open: As the True Doctrine of the Corruption and Generation in Ten brief Aphorisms~ illustrated with most plain and faithfull commentaries, out of the pure Light of Nature." Translated by J.H. Oxon, 1665. 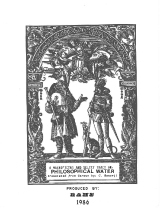 Commentaries, Notes and Observations regarding the Chymical Medicine of Johannes Poppius. Leipzig, Publ. by Thomas Schurer's heir and Matthias Gotzen. Printed by Gregorius Ritzscgen in the year 1638. Translated from the original by Leone Muller. A Greek Abbott (c. 550-625), taken out of the Emperour's Library concerning the Philosopher's Stone. London, printed for Dorman Newman at the Kings Arms, in the Poultry, 1678.
or a discourse of that Immortal Dissolvent of Paracelsus & Helmot. Published in London in 1675 by James Astell. Pyrophilas. Translated by Robert Firmage. "Aperta Arca Arcani artificiossimi" or "The Revealed and Open Chest of the Greatest of All Most Articial Secret of Nature of The Greater and Lesser Edifyer Together with the Proper and True Physica Naturali Rotunda. Described comprehensively through a Visionem Chymicam Qabalisticam." Hamburg and Stockholm. 1687. 150 pages. In five parts. (Photocopy - Yet to be transcribed). by Adiramled. (Delmar D. Bryant). A Course of Lessons in Practical Redemption. For the Use of Occult Students Being a New Unfoldment of Sexual Soular Science. by Adiramled (Delmar D. Bryant). The Generation of Gold. A course of practical lessons in Metallic Transmutations. For the use of Occult Students being a New Illumination. Regarding the Secret Science of the Sages. 136 pages. 12 practical lessons. by Delmar De Forest Bryant. The Inspiration of Rame Vidello. The Sun Center Publishing co, Boston, Mass. 1911. RAMS Distributed. Photocopy. Devoted to the Exposition of the OLD THOUGHT: The Transfiguration of Humanity through a Discovery of the Divine Principle in Nature: The Science of Hermes, The Art of Alchemy. Vol.1, no.1, Jan., 1901 - Vol.3., no.12 - Dec.,1903. Originally an addition to "Of natural & supernatural things" by Basil Valentine. London, Printed, and are to be Sold by Moses Pitt at the White Hart in Little Britain, 1670. "The Last Will and Testament of Basil Valentine". Monke of the Order of St. Bennet. London. Printed by S.G. and B.G. for Edward Brewster, and to be sold at the Sign of the Crane in St. Paul's Church Yard. 1672. "Philosophia Maturata" An exact piece of Philosophy containing The Practick and Operative Part thereof in gaining the Philosopher's Stone. With the Ways and How to Make the Mineral Stone, and the Calcination of Metals. 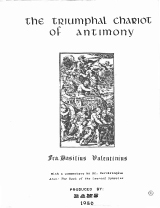 Whereunto is added, A work compiled by St. Dunstan (924-988) concerning the Philosopher's Stone, and The Experiments of Rulandus and Preparations of Angelo Sala. Published by: Lancelot Colson, Driston. Phys. And Chym. London. Printed for G. Sawbridge and are to be sold at his house upon Clerken-well-Green. 1668. "A Brief Rehearsal of the Preparation of the Philosophers Stone". Translated by John Houpreght. London, 1680. "18 Short Tracts of Alchemy"
"Glory of Light". B.M. Sloane 2219. "Bacstrom's Prologue to Zoroaster's Cave." "Epistle" written and sent by the Bretheren of the R. C.
"An Hundred Aphorisms", anonumous. Sloane MSS 1321. "The Secret Fire of the Philosophers", No Author or Date. "The Practice of the Philosophers", anonymous. "The First Matter", No Author or Date. "Opus Philosophorum", British Museum Sloane 319. "Parable of the Fountain", by Count B. Trevisan. B.M. Sloane MS 3641. "Three Tracts of the Great Medicine of the Philosophers for Humane and Metalline Bodies." All written in Latin by Eirenaeus Philalethes Cosmopolita. Translated into English for the Benefit of the Studious, By a Lover of Art and Them. London. Printed and Sold by T. Sowle at the Crooked-Billet in Holy-Well-Lane, Shoreditch. Anno: 1694. "Of Nature and Art" by I.C.H., 1730 , "Liber Trium Verborum" of King Calid (Khalid ibn Jazid), the son of Sazichi", & "The Philosophical Cannons of Paracelsus." An Alchemical Anthology. 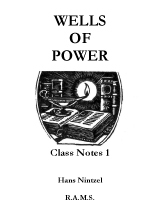 Compiled by Hans Nintzel. "The Terrestial Heaven", by Eugene Canseliet. "The Fiery Wine Spirit", by Basil Valentine. Rogerii Baconni's "Tract on the Tincture and Oil of Antimonii". Hans Nintzel. Assorted class notes. of Johan Gottfried Tugel's Experimental Chymistry etc. Leipzig 1766. Translated from the German by: Sigismond Bacstrom, M.D. 1798.
by William Baron von Schroeder, F.R.S., 1684. Published by FR. Roth Scholtzen Nurnberg 1733. Translated from the German by S. Bacstrom M.D., 1797. Translated by S. Bacstrom in 1787. This work is thought to have been written by Cramer. The Great Work of the Lapis Sophorum According to Lamspring's Process. Translated from the German by Sigismond Bacstrom, M.D. 1804. A Noble Ancient Philosopher, Concerning the Philosophical Stone; Rendered into Latin Verse by Nicholas Barnaud Delphinas, Doctor of Medicine, a zealous Student of this Art. Monsr. De La Brie's PROCESS. Extracted from a French work, entitled, "Histore dee Indies Orlentales." par Moner. Sou chu de Rennefort Admiral. Suivant la copie de Paris. a Leide 1688. 8 vol. Translated by S. BACSTROM, M.D. 1797. From the files of and translated by S. Bacstrom, M.D.1797. by Joel Langelottus, Physcian and Privey Councellor of his Serine Highness the Reigning Duke of Holstein Gottorp. Translated from an old manuscript. Process for the Lapis with Nitre and Salt. or the Philosophical Double Mercury. The Short and Long way for obtaining the Universal Tincture by Dorothea Juliana Wallachin. Leipzig, 1705. Extracted from Mago Cabbalisticum, Hamburg, 1735. From the files of and translated by S. Bacstrom, M.D. "The Centurys: First through Fifth", or "Wealthy Store-house of Treasures" (5 books), 1667 from the Complete Works of Glauber, trans. by Chris. Packe. (GLAUBER / CENTURYS: .doc, .pdf). 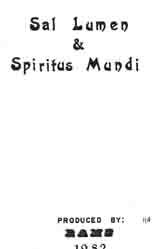 "Miraculum Mundi", from the Complete Works of Glauber. Translated by Chris Packe. "The Prosperity of Germany" First through Fifth Parts from the Complete Works of Rudolph Glauber. Translated by Chris Packe. (GLAUBER / PROSPGERMANY: .doc, .pdf). "A Short Book of Dialogues", or "Certain Colloquies of some Studious Searchers after the Hermetick Medicine and Universal Tincture." Complete Works of Glauber, trans. by Chris. Packe. R.A.M.S. 1982. (GLAUBER / DIALOGUES: .doc, .pdf). "Novum Lumen Chymicum", or "A New Chymical Light", from the Complete Works of Glauber, trans. by Chris. Packe. (GLAUBER / NOVUM: .doc, .pdf). "Of The Mercury of Philosophers" and, "Of The Salt of Philosophers" from the Complete Works of Rudolph Glauber. Translated by Chris Packe. (GLAUBER / 3PRINCIPLES: .doc, .pdf). "What we are to understand by Elias the Artist, and what he is to reform in the World at his coming". Complete Works of Glauber, trans. by Chris. Packe. (GLAUBER / ELIASARTISTA: .doc, .pdf). "De Purgatorio Philosophorum" or "A Treatise Concerning the Purifying Fire of the Wise Men", from the Complete Works of Rudolph Glauber. Translated by Chris Packe. (GLAUBER / PURGATORIO: .doc, .pdf). "A Treatise on the Animal Stone" from the Complete Works of Rudolph Glauber. Translated by Chris. Packe. Faithfully Translated out of the High-Dutch. (GLAUBER / ANIMALSTONE: .doc, .pdf). "A True and Perfect Description of Extracting Good Tartar from the Lees of Wine." from the Complete Works of Rudolph Glauber. Translated by Chris. Packe. (GLAUBER / TARTAR: .doc, .pdf). "The Hellish Goddess Proserpina with Elias the Artist: and also Of the Secret Fire of the Philosophers" from the Complete Works of Rudolph Glauber. Translated by Chris Packe. (GLAUBER / PROSERPINA: .doc, .pdf). "Libellus Ignium", or "Book of Fires". Complete Works of Glauber, trans. by Chris. Packe. (GLAUBER / IGNIUM: .doc, .pdf). "Of The Three Most Noble Stones Generated by Three Secret Fires" from the Complete Works of Rudolph Glauber. Translated by Chris Packe. "Secret Fire of the Philosophers". Complete Works of Glauber, trans. by Chris. Packe. "Annotations upon The Continuation of Miraculum Mundi", including "A Trestise of The Nature of Salts", from the Complete Works of Rudolph Glauber. Translated by Chris Packe. "A Trestise of The Nature of Salts", from the Complete Works of Rudolph Glauber. Translated by Chris Packe. (GLAUBER / SALT: .doc, .pdf). "A Treatise of the Signature of Salts, Metals, and Planets" including "The Explication of the Word Sal, by Bernhardus Comesius", from the Complete Works of Rudolph Glauber. Translated by Chris Packe. (GLAUBER / (SIGNATURE: .doc, .pdf). (GLAUBER / FURNACE: .doc, .pdf). "The Book of Philip Theophrastus Bombast of Hohenheim"
(GLAUBER / BOOK_PARACELSUS: .doc, .pdf). "The Apology of John Rudolph Glauber, Against the Lying Calumnies of Christopher Farnner." (GLAUBER / APOLOGY: .doc, .pdf). "A Spagyrical Pharmocopoea", or "Dispensatory". Being an exact discription by what means, profitable, efficacious, and penetrating Medicines may be made, and prepared out of Vegetables, Animals, and Minerals; after an unwonted and easie method. First through Seventh Parts with First through Third Appendix Parts of Seventh Part. Complete Works of Glauber, trans. by Chris. Packe. "Of The Birth and Nativity of Metals"
(GLAUBER / BIRTH_METALS: .doc, .pdf). (GLAUBER / AURUM / UNIVERSAL_MEDICINE: .doc, .pdf). "The Heaven of Philosophers", or A Book of Vexations. By Philippus Theophrastus Paracelsus. (GLAUBER / HEAVEN: .doc, .pdf). (GLAUBER / AURUM / AURUM_2: .doc, .pdf). (GLAUBER / MINERAL_WORK: .doc, .pdf). (GLAUBER / AURUM / AURUM: .doc, .pdf). "The Explication of Miraculum Mundi", Translated by Chris Packe. (GLAUBER / MIRACULUM: .doc, .pdf). By John Joachim Becher. 1680. 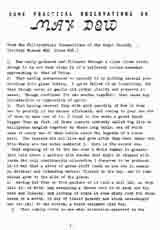 With Appendix 1: Errata’s are thus corrected or notes added (2011) and Appendix 2: An extract from Thompson, C. J. S., “Poison mysteries in history, romance and crime”. (Published by J.B. Lippincott, 1923). Chapter XVII. A Mystery of the Austrian Court in the Seventeenth Century. of the most cunning and famous master of physic / Master Hieronymus Brunschwig. Originally translated and imprinted at London in the Fleet Street by Laurence Andrews in the Sign of the Golden Cross by Fleet Bridge. In the year of Our Lord MCCCCCXXVII (1527), the 17th day of April. Transcribed to Modern English by Theophrastus von Oberstockstall, 2013. 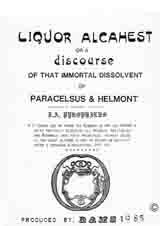 A Collection of Ten Treatises in CHYMISTRY, concerning The Liquor, Alkahest, the Mercury of Philosophers, and other Curiosities worthy the Perusal. Written by Eirenaeus Philalethes, Anonymous, Johann Baptist Van-Helmont, Dr. Fr. Antonie, Bernhard Earl of Trevisan, Sir George Ripley, Roger Bacon, George Starkey, Sir Hugh Platt, and the Tomb of Semiramis. LONDON, Printed for William Cooper, at the Pelican in Little Britain, 1684. 99 pages. (Collectanea-Chymica: .doc, .pdf). NB: This is considered to be the text that was original advertised by RAMS as "A Compendium of Alchemical Experiements" - photocopy - Elliot (Editor). acquired from The Fountain of Nature, and Manual Experience, by John Beguinus Almoner, to the most Christian King of France, was first printed in London for Thomas Passenger, at the sign of the three Bibles upon London Bridge in 1669. Transcribed to Modern English, R.A.M.S. digital, 2018. "The Turba Philosophorum." "The Epistle of Arisleus, prefixed to the Words of the Sages, concerning the Purport of this Book, for the Benefit of Posterity". Probably 12th Century. [72 Dictums & Conclusion] 99 pages. Originally printed within "Alchemy Rediscovered and Restored" by Archibald Cochren(1941). 'TRACTATUS AUREUS,' OR "THE GOLDEN TRACTATE OF HERMES"; (1610). Originally printed within "Alchemy Rediscovered and Restored" by Archibald Cochren(1941). "The Book Concerning the Tincture of the Philosophers" by Philippus Theophrastus Bombast, Paracelsus the Great From "Paracelsus his Archidoxis". Faithfully and plainly Englished, and Published by, J.H. Oxon. London, Printed for W.S. and are to be sold by Thomas Brewster at the Three Bibles in Pauls Church-yard. 1660. "Alchemy Rediscovered and Restored" by Archibald Cochren. With an account of the extraction of the seed of metals and the preparation of the medicinal elixir according to the practice of the hermetic Art and of the Alkahest of the Philosopher. Philadelphia, David McKay. (1941), 115 pages. "The Treasure of Treasures" by Paracelsus. As also The Water-Stone of The Wise Men; Describing the matter of, and manner how to attain the universal Tincture. Faithfully Englished. And Published by J.H. Oxon. London, Printed for Giles Calvert, and are to be sold at the Black Spred Eagle, at the West end of Pauls, 1659. "The Aurora of the Philosophers" By Philippus Theophrastus Bombast, Paracelsus the Great Which He Otherwise Calls His Monarchia. [20 chapters + notes]. "The Art of Distillation" by John French. London, November 25, 1650. [6 Books]. "The Six Keys of Eudoxus" by Eudoxus. "An excellent discourse of the admirable force and efficacie of Art and Nature" by Roger Bacon. "The Smaragdine Table" of Hermes, Trismegistus of Alchimy, and "A briefe Commentarie" of Hortulanus the Philosopher, upon the Smaragdine Table of Hermes of Alchimy", (1541). Originally printed within Bacon's "Mirror of Alchemy" (1597). "The Book of the Secrets of Alchimie", composed by Kalid the son of Iazich, translated out of Hebrew into Arabick, and out of Arabick into Latine, and out of Latin into English. Originally printed with Bacon's "Mirror of Alchemy" (1597). + = added October, 2005. >> = added January, 2011. # = added February, 2012 s part of final update for Complete collection.